The 1st Battalion of the Duke of Lancaster's Regiment through Accrington to exercise their Freedom of the Borough and remember the Accrington Pals who fought in the First World War. 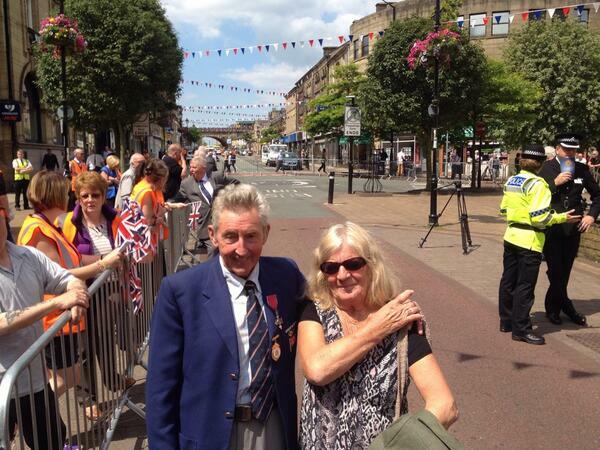 A Lancashire town came to a standstill today as thousands turned out to remember the legendary Accrington Pals. On the anniversary of the Battle of the Somme in World War 1, when the Pals' suffered huge losses, the streets were packed as the Duke of Lancaster's Regiment marched through the town in memory of the Pals. And in true Lancastrian fashion it wasn't a sombre affair as Paul Crone reports. Soldiers from the 1st Battalion Duke of Lancaster's Regiment will march through Accrington today. The regiment, known as the lions of England, will pay tribute to the Pals - who suffered significant losses on this day in 1916, at the start of the Battle of the Somme. It's also eight years today that the Duke of Lancaster's Regiment was formed. The history of The Duke of Lancaster's Regiment importantly includes the Accrington Pals so it is fitting that they have chosen this the centenary year of the outbreak of the first World War to exercise the Freedom of the Borough. "The Regiment already has the Freedom of the Borough of Hyndburn and we want to demonstrate our pride and thanks to our soldiers who risk their lives both at home and abroad to serve our country. "The parade will give the people of Hyndburn the opportunity to show their appreciation on behalf of the Borough for their gallant and courageous service." It is a tremendous honour for the Regiment and its soldiers to exercise the Freedom of Hyndburn, and it is fitting that we will do so in the home town of the Accrington Pals on the anniversary of their great sacrifice. "Parades such as this give us an opportunity to publicly express our gratitude to the communities our soldiers come from." The annual Accrington Pals Memorial service at the Pals Memorial on Church St Accrington will also take place on July 1 at 11.30am. The time of the march and the parade route are available on the Council's website.